We went on a journey through mainland Europe to investige claims that the WQS is the real dream tour. In the second week of August a large group of international pros descend on mainland Europe, as the Euro-leg of the qualifying series hits its stride as it bowls in Lacanau, on the west coast of France. This year we decided to follow them and cast an eye over an often overlooked part of the competitive surf ladder to investigate claims that the WQS is the real dream tour. 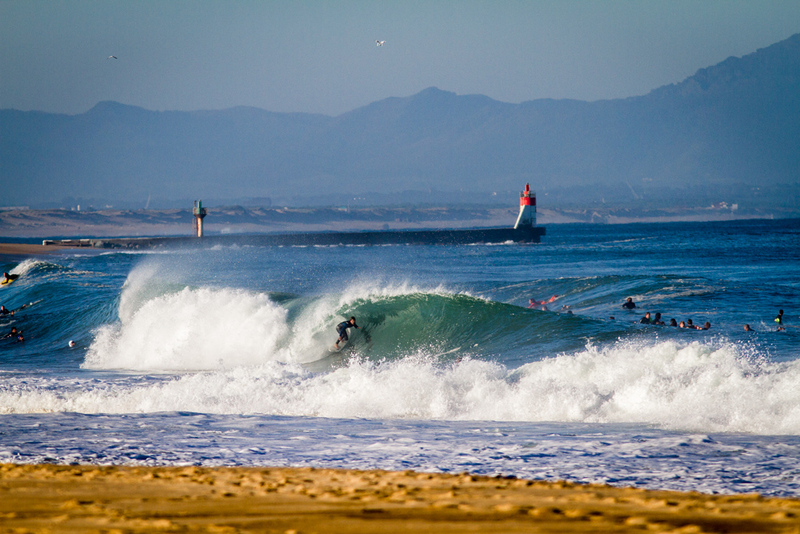 Nicholas Vergas throws a full rotor during a warm up free surf in Anglet. 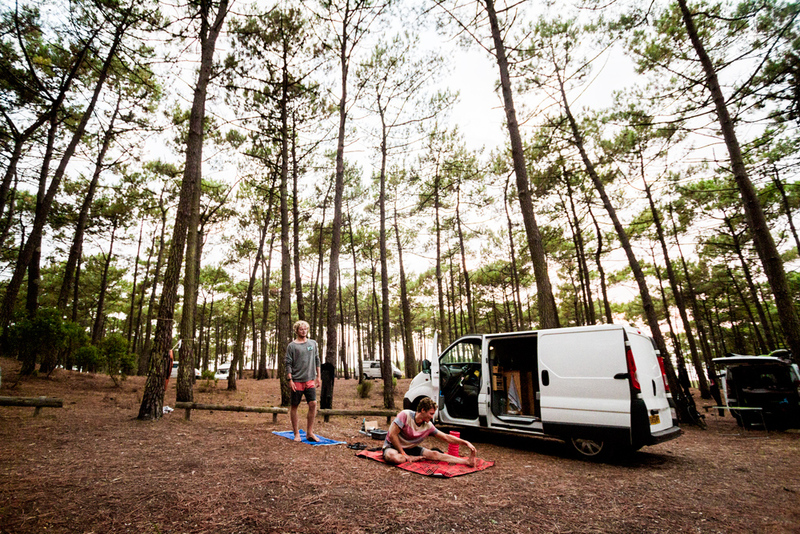 The day after I arrived in Lacanau I found British competitor Jobe Harriss reading in the back of his van, as sunlight flooded through the canopy of the pine forest where he had set up camp. It was a lay day, and the rest of the camp had head off into town for supplies. I returned later that evening to find Jobe had been joined by Luke Dillon, as well as a small crew of fellow Brits and a few Italians who were also competing in the competition. Luke’s start to the week had been altogether less relaxing than Jobe’s, as the clutch on his van had gone, resulting in a hair raising drive to a garage in second gear, where he’d discovered they would need to keep it in for the duration of the comp. In its place he’d been given a significantly less roomy hire car, the back of which would serve as bedroom for Luke and his girlfriend for the rest of the week. Brits Angus Scotney, who was along for the ride with a snapped ligament in his knee, and Jobe Harriss stretch at their base camp in the forest. The forest seemed to be a haven in an otherwise fairly hectic town, however it was not without its own nocturnal revelry. On the first night the sound of Germans socialising, complete with recorder, cut through the stifling evening air. Their merriness, however, was short lived as they woke the next morning to find the clothes left out on their washing line had been sliced to pieces and a banana stuffed in their exhaust, in what seemed an excessively hostile move by some disgruntled fellow forest campers. The journey from the forest to the beach in the centre of town each morning was a surreal one. The break of dawn would reveal a series of end of night tableaux, featuring young lovers necking in a shop doorway or a bloke being sick down a sewage grate. Both Lacanau and Anglet, which is the next stop on the tour, are low ranking in terms of points and prize money available. As a result they are easier to get int0, meaning there are a whole spread of competitors in attendance. From those sleeping in tents or in the back of their cars, travelling off their own back, without major sponsors, all the way up to those knocking on the door of tour qualification, looking for heat practice and easy points, hauled up in kitted out apartments, paid for by their big name international sponsors. These circumstantial differences obviously have their baring once the surfers enter the water. For those eliminated before round five there is no prize money at all, meaning for those not provided with competition travel budget by sponsors an early round loss leaves them severely out of pocket- a fact that would undoubtedly play on a competitors mind when placing that final critical turn. But equally it’s clear to see the ocean doesn’t care who the big names are and often the higher ranked surfer would fall, usually thanks to a mixture of bad luck and minuscule errors; a tiny paddle down the beach putting them slightly of position for an oncoming set, a slightly late hit to the section – movements which at the time seem so small and insignificant, but are singled out in hindsight to have cost the heat and sent the surfer packing. The brutality of the format is instantly striking to those used to watching the CT comps. Unlike in the big leagues, round one is an elimination round, with 144 competitors, many of who’m had travelled from the other side of the world taking each other on in four man 20 minute heats. For the most part the early rounds feature conditions the competitors themselves would diplomatically refer to as challenging, but the rest of the surf world would call a load of shite. 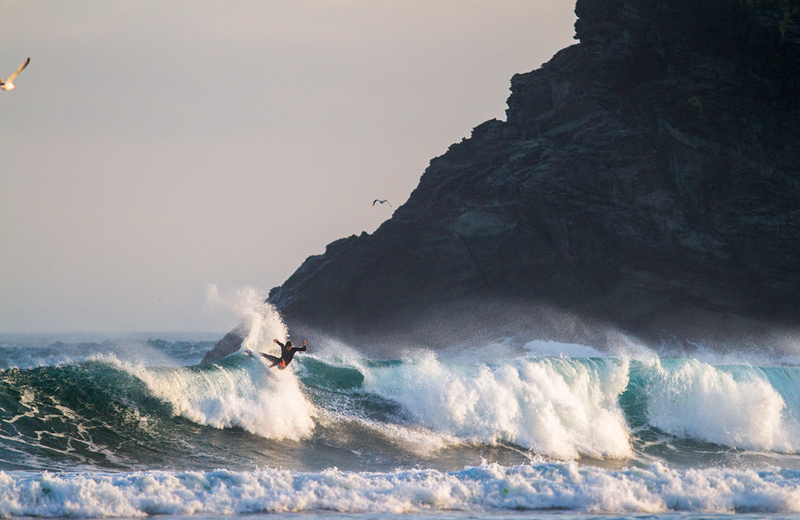 Competition winner Kanoa Igarashi tackles a solid section during a free surf in Pantin. When not tripped up by the aforementioned, it was the most seasoned and well trained competitors who would emerge victorious in the early rounds. You could see how over years of training and coaching, many had learnt to risk mediate their every manoeuvre, finely tuning each turn so it appears simultaneously sufficiently critical to the judges, but also is a very safe option for the section available. Luckily for spectators however, this style of surfing melts away into the later rounds, where it is replaced by big risk manoeuvres and crazy airs, driven, as on the CT, particularly by the Brazillian contingent. The final mainland Euro-leg saw the tour travel away from South West France, with its oppressive heat and endless stretches of body and umbrella strewn sand, to the cooler, quieter region of Galacia in North West Spain. Here the scenery was beautiful and the potential for good waves a little greater. As a much higher ranked event it also attracted all of those at the top of the QS rankings. Although a little sweeter than the first rung, this top tier limbo, in which many surfers can be stuck in year after year, still felt far away from the Pro Surfer dream so many imagine. It was still brutal. The waves were still ‘challenging’ for the early rounds, and minute mistakes still sent competitors back to the airport after only twenty minutes in the brine. 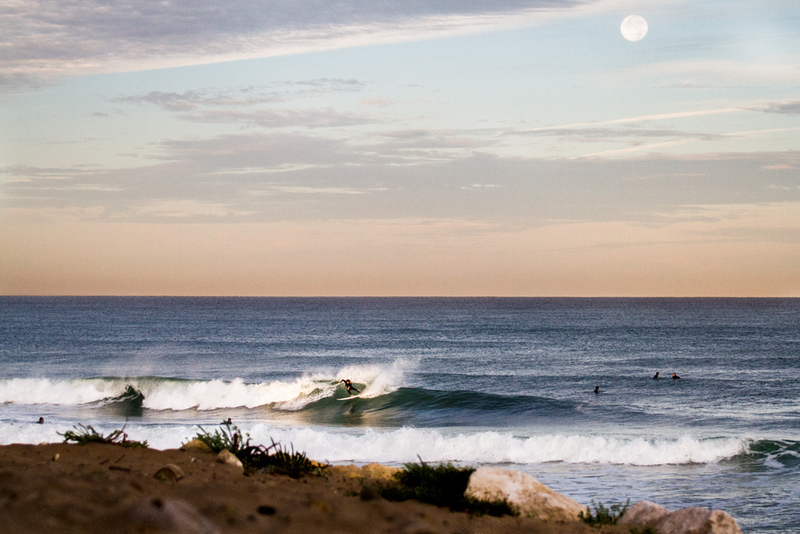 Many of the pros stopped off in Hossegor in between Lacanau & Anglet for a bit of R&R. Here local boy Thomas Esquillot shows them how it’s done at La Graviere. When asked why they want to partake in this endless conveyor belt of competitions, particularly when the professional free surf route exists, all the competitors have similar answers; they love to win and they want to be the best. It seems to me not only that, but also that they want to be validated and celebrated and known by all to be the best. It’s a hard thing for an everyday surfer to relate to, which perhaps explains the continuing relative disinterest in competitive surfing, particularly at a low level. Surfing is after all an inherently uncompetitive sport and indeed one where with great swathes pride themselves on its ability to be a purely solitary pursuit. Many of such surfers hold a healthy disregard for the obsessively competitive competition surfer, accusing them of lacking ‘soul’. In fact I would go so far to say that there is no other sport, where raw competitiveness is simultaneously so derided by one group of practitioners, whilst driving another to dedicate so much energy and money on what is for the most part a brutally disappointing and thankless process. However isn’t it these opposite but equally staunchly held interpretations that are so common within surfing that make it so entertaining. Yes, we all love those explorers pioneering new waves and regions, but these low ranked regional comps are integral rungs that gift us the standard of surfer that exists today. They make sure there’s no way those who make it to top level of competition have fluked their way there. And so to those who compete endlessly in them we say; thank you. It’s a tough job, but someones got to do it.